Wesley E. Johnson was born in Ojai, and became involved with art while a student at Ventura College, where he had originally planned to study engineering. 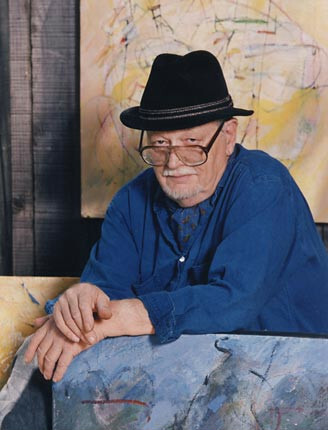 He continued his art education at the University of California at Santa Barbara, working under influential painter and theoretician Howard Warshaw. Johnson considers his work to fall into the category of abstract expressionism, with strong influences from both cubism and impressionism. His work has run the gamut from figurative murals painted on the commissary walls at Fort Ord, to large, colorful abstract oils and acrylics on canvas. Some Johnson murals are painted on the walls and ceilings of centuries-old buildings in Milan and Paris. Others works are in an ultramodern grave de egglomises process that involves removing the silver backing from mirrors and painting into the etched surface, giving a multidimensional effect that seems to surround the viewer. Johnson’s long and varied career has included a stint in the U.S. Army, restoring the etching plates of noted American Western artist John Edward Borein, and many years of teaching at Ventura College. He has been the recipient of numerous awards, including the prestigious James D. Phelan Award for Literature and Art. Wes considers his greatest gift as an artist to be his innate color sense. His paintings have a wonderful contrast of lights and darks, images that are abstract, yet never totally non-objective, and marvelous, strong colors that absolutely resonate off one another and pull the viewer right into the painting. Wesley Johnson’s documentation took place in 1999. The FOTM Archive contains extensive information about this artist.